External insulation on commercial or residential heating or air conditioning ducts in North America. It is suitable for the exterior of rectangular or round sheet metal ducts and spaces or surfaces where temperature and condensation must be controlled. KN Utility Insulation is used as thermal and/or acoustical insulation in the appliance, equipment, industrial, commercial, and marine markets. KN Insulation has been successfully used as a Red List free and formaldehyde-free core in double wall duct systems. Insulation is delivered to the installation site as one packaged bag containing varying amounts of product. Reference service life: 75 years. One square meter of installed insulation material, packaging included, with a thickness that gives an average thermal resistance of RSI=1m2·K/W over a period of 75 years. At the installation site, insulation products are unpackaged and installed. Tape may be used to install duct wrap. No material is lost or wasted because scraps are typically used to fill corners or crevices. Plastic packaging waste is disposed (15% to recycling, 68% to landfill, and 17% to incineration), and no maintenance or replacement is required to achieve the product's life span. After removal, the insulation is assumed to be landfilled. For unfaced products, the manufacturing stage dominates the results for all impact categories except for eutrophication and respiratory effects, where the raw materials acquisition stage dominates. Following these two stages, the next highest impacts come from transportation and disposal, which have a similar contribution. However, for non-carcinogenics, the disposal stage is the second highest contributor due to the landfilling of the product at end of life, and for smog, the transportation is the second highest contributor due to the use of trucks and rail transport. The impact of the raw material acquisition stage is mostly due to the borax and soda ash in the batch. Since sand and borax are melted in the oven, they are not released into the air as fine particulates and therefore likely actually contribute less than what is calculated in the results tables below. The manufacturing stage shows major contributions to all impact categories. The landfilling of the discarded product contributes to the disposal stage. The only impacts associated with installation and maintenance are due to the disposal of packaging waste, which is the smallest contributor of all the stages. For faced products, the raw material acquisition stage is higher compared to the unfaced products because it includes potential impacts from the facing. Potential impacts for transportation and disposal are also higher due to the added mass from the addition of facing. The energy required to melt the glass and produce the glass fibers is the largest contributor to the manufacturing stage for all impact categories. Due to normalization and weighting, different stages can dominate the characterized and single score results. The batch ingredients sand and borax contribute significantly to the respiratory effects category, causing the raw materials acquisition stage to dominate the mPt results, but not the characterized results. However, they are not released into the air as fine particulates and therefore likely actually contribute less than what is calculated in the raw material acquisition stage. 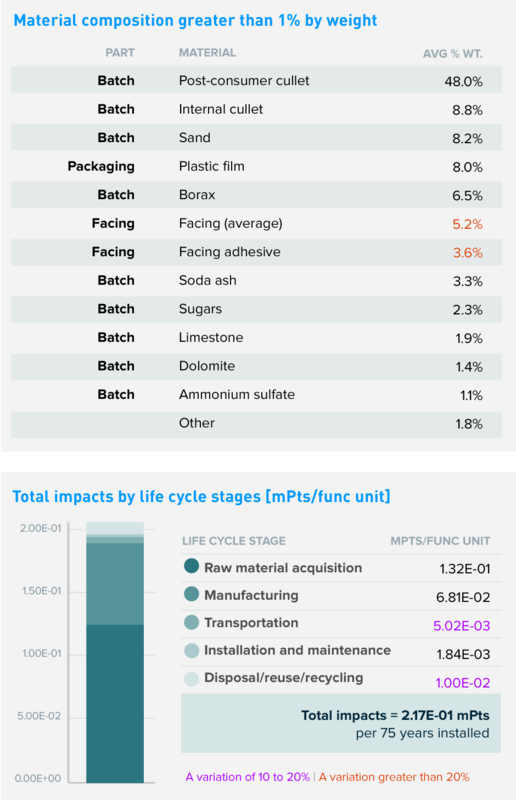 What this means is that the manufacturing stage may have a larger share of the impact than what is displayed in the total impacts by life cycle stage. KN Utility Insulation is an unfaced product, while Atmosphere Duct Wrap has the option of coming unfaced or with FSK facing. When FSK facing is added, there is an increased amount and different types of raw materials which impacts the raw material acquisition stage. The increased mass of the product with FSK facing causes a slightly higher transportation impact. There is also an increased impact during disposal due to the FSK facing materials being landfilled. Results represent the weighted average using production volumes for the products covered. Variations of specific products for differences of 10–20% against the average are indicated in purple; differences greater than 20% are indicated in red. A difference greater than 10% is considered significant. Knauf and Manson are committed to providing products that conserve energy and preserve natural resources. These products use ECOSE® Technology, which is a plant-based binder adhesive instead of a fossil fuel based binder. ECOSE Technology represents a fossil fuel avoidance equivalent of 100,000 barrels of oil a year for Manson and Knauf Insulation products combined. Our products contain a high degree of recycled content, which translates to 20% less glass melting energy and a 25% reduction in embodied carbon. Our utilization of recycled content reduces mining impacts by 60%. In fact, Knauf and Manson products combined use 10 railcars of recycled glass a day. All glass fiber made by Manson and Knauf is audited by a 3rd party to ensure biosoluble chemistry from a health and safety standpoint. *In the installation and maintenance phase, packaging waste in module A5 is the only contributor to the potential impacts. Materials or processes contributing >20% to total impacts in each life cycle stage Batch material and binder material production. Energy required to melt the glass and produce the glass fibers. Truck and rail transportation used to transport product to building site. Transportation to disposal and disposing of packaging materials. Transportation to landfill and landfilling of product. See the additional EPD content required by the UL Environment PCR on page 4 of the Transparency Report PDF. Knauf Insulation and Manson Insulation Products LCA Background Report (public version), Knauf 2018. GaBi 7, GaBi 2017 database. ISO 21930:2017 serves as the core PCR along with EN 15804 and UL Part A. May 2, 2018. Technical Advisory Panel members reviewed and provided feedback on content written by UL Environment and USGBC. Past and present members of the Technical Advisory Panel are listed in the PCR. Version 2.0, April 2018. PCR review conducted by Thomas Gloria, PhD (chair, t.gloria@industrial-ecology.com); Andre Desjarlais; and Christoph Koffler, PhD. Download PDF SM Transparency Report/Material Health Overview, which includes the additional EPD content required by the UL Environment PCR. SM Transparency Reports (TR) are ISO 14025 Type III environmental declarations (EPD) that enable purchasers and users to compare the potential environmental performance of products on a life cycle basis. They are designed to present information transparently to make the limitations of comparability more understandable. TRs/EPDs of products that conform to the same PCR and include the same life cycle stages, but are made by different manufacturers, may not sufficiently align to support direct comparisons. They therefore, cannot be used as comparative assertions unless the conditions defined in ISO 14025 Section 6.7.2. ‘Requirements for Comparability’ are satisfied. Comparison of the environmental performance of building envelope thermal insulation using EPD information shall be based on the product’s use and impacts at the building level, and therefore EPDs may not be used for comparability purposes when not considering the building energy use phase as instructed under the PCR. Full conformance with the PCR for building envelope thermal insulation allows EPD comparability only when all stages of a life cycle have been considered, when they comply with all referenced standards, use the same sub-category PCR, and use equivalent scenarios with respect to construction works. However, variations and deviations are possible. Example of variations: Different LCA software and background LCI data sets may lead to different results upstream or downstream of the life cycle stages declared.